Bread for the World Institute, Silver Spring, MD. 1998. Paperback. 138 pp. ISBN: 1884361072. Bread for the World’s new report on hunger– celebrating BFW’s 25th anniversary– stakes the claim that we know how to eliminate hunger and have sufficient resources to do so in the United States and worldwide. “The end of hunger is within reach” within 15 years, asserts Richard Hoehn, Director of the Bread for the World Institute, in the lead article. 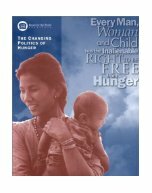 Empowering the hungry is the solution returned to by each of the dozen authors in this report. Each agrees that the right to food is more basic than almost any other human right. Former Bread staff-person Kathy Selvaggio gives an insightful background piece on the movement to achieve debt forgiveness among the world’s poor countries, a movement deftly cultivated by Oxfam, and recently coordinated by Jubilee 2000. (The Winter 1998 Hunger Notes will have a special section on debt forgiveness and Jubilee 2000 initiatives). The World Bank and International Monetary Fund boards have begun to initiate debt forgiveness by poor countries under the HIPC (Heavily Indebted Poor Countries) Initiative, for which grassroots movements can take some credit. Twenty-five years of domestic hunger programs are described by Leon Howell, tracing the fluctuations in resources given through school meals, food stamps and Women, Infants, Children (WIC). In 1997, total Federal food programs amounted to $36.4 billion. In the end, the report argues for creative political action, such as, “the linking of people across borders [to] bear witness through joint political action.” The authors also exhort the reader to vote and run for office.